Success Academy’s Incredible Hypocrisy | Daniel Katz, Ph.D.
Eva Moskowitz wants to continue to expand her Success Academy chain of “no excuses” charter schools, but is concerned that New York Mayor Bill de Blasio will not automatically and enthusiastically endorse her plans as was customary under Mayor Michael Bloomberg. Following the model of her successful Albany rally last Spring that led to a state budget forcing New York City to pay rent for all charter schools, charter enthusiasts plan a rally for Thursday, October 2nd in Foley Square at 9am which they are dubbing “Don’t Steal Possible”. I have seen organizers on social media promise as many as 10,000 attendees, many of whom I presume will be Success Academy teachers and students who, like the weekday rally in Albany, will be given time off from a scheduled school day to provide appropriate optics for the event. The 143,000 kids that they repeatedly mention refers to a “report” from charter school advocacy group “Families for Excellent Schools” that cited 371 DOE schools where student performance on the 2013 state examinations did not pass 10% being labeled as proficient. The purpose of the rally and of Ms. Moskowitz’s expansion plans is to offer “possible” to all of those students so that they can “escape” from their failed schools. They really have some nerve. State Education Commissioner John King asked the College Board to “replicate research” to determine what PSAT and SAT scores predict first-year success in four-year colleges. The College Board was asked to correlate SAT scores with college grades to create probabilities of college success. You can read the report here. Keep in mind that research shows that the SAT’s predictive power is only 22 percent. High school grades are a far better predictor of college success. The lack of validity of scores, without the context of grades, was not taken into consideration. * English Language Arts: a 75 percent probability of obtaining a B- or better in a first-year college English course in a four-year college. * Math: a 60 percent probability of obtaining a C+ or better in a first-year math course in a four-year college…. ….When the cut scores were set, the overall proficiency rate was 31 percent–close to the commissioner’s prediction. The proportion of test takers who score 1630 on the SAT is 32 percent. Coincidence? Bet your sleeveless pineapple it’s not. Heck, the way I see it, the kids did not even need to show up for the test. Argue, if you must, that the new proficiency standard is the appropriate way to set up how the exams are assessed. But don’t call it “grade level” or “passing.” They are neither of those things, nor were they designed to be those things. 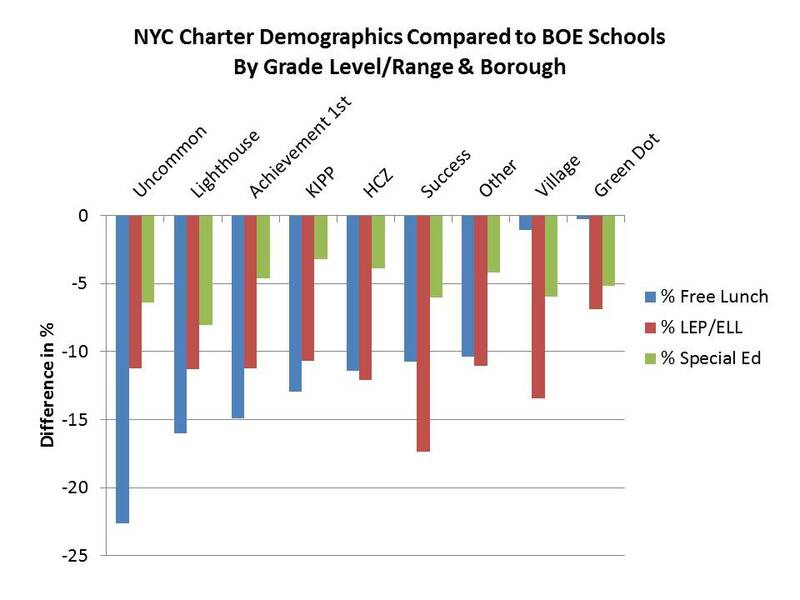 Success Academy wants you to believe that they are rallying so that nobody will “Steal Possible” from the students in New York City’s most struggling public schools, but all the data available about their past and current practices suggests that even if many of those students did win lottery seats in a Success Academy, many of them would be pushed out of the school. Those children are being used to improve the appeal of Ms. Moskowitz’s expansion plans even though probably none of them will be present at tomorrow’s rally. After all, they have school to attend, and no NYC principal is allowed to dismiss an entire school’s worth of children to a rally to pressure the mayor and Albany. Third, if this was really a movement to tell the public and officials to “Don’t Steal Possible,” then one would assume that there would be causes involved that aided all of our city’s children, not just the ones that win charter lottery seats and are then allowed to stay at those charters. Again from Professor Bruce Baker of Rutgers, Albany has manipulated its base state funding formula in ways that have shorted New York City somewhere between $3-4000 a YEAR per CHILD below previous calculations of state aid. That amounts to $3-4 BILLION in state aid ANNUALLY that Albany has kept from reaching New York City. Across the entire state of New York, the Gap Elimination Adjustment has deprived the average school district of $3.1 MILLION annually, and Governor Cuomo aggressively pursued and got a property tax cap so that districts cannot choose to make up the lost money locally. Consider how much “possible” has absolutely been stolen from public schools in New York City and across the state by these policies, and then ask if Families for Excellent Schools and Success Academy’s wealthy backers in the financial industry will rally to change them. The answer is, of course they won’t. Those same donors and Ms. Moskowitz’s own PAC have donated generously to Andrew Cuomo’s campaign. And this is the hypocrisy. Ms. Moskowitz is going to excuse her teachers and students from a day of school to rally in alleged support of all of those kids she claims are “trapped” in “failing” DOE schools, and there is no doubt that an unacceptable number of our most vulnerable students are indeed in schools that struggle. But there is NO evidence that Ms. Moskowitz wants all or even a bare majority of those students in HER schools. There IS plenty of evidence that the most vulnerable children to reach a Success Academy find it very difficult to remain there, and there is incontrovertible evidence that Ms. Moskowitz and her financial backers support the reelection of a Governor who has choked schools of money for his entire first term in office. Excellent piece Daniel! Will definitely share this!!! Please don’t steal possible. They are planning to sell it. Is Success actually closing schools for this rally like they did for the fight against De Blasio, and/or have they issued a formal policy on the subject of letting teachers and students attend? I can’t think of a legitimate justification, but I am very curious about whether they’ve ignored critiques or responded to them. Their Twitter account is promising 10,000 people at this rally. I don’t think they’d make that pledge unless they intend to deliver on it! Makes sense – do you know if they’ve tried to justify this practice at all? I think it’s pretty indefensible, but I’m curious if they have a supposed rationale. Honestly, I don’t know. As a rule, they have not been especially keen on explaining themselves, and they led a lawsuit to prevent the state Comptroller from auditing them. Transparency is not built into the business model. Do you have a link to information about the lawsuit, by any chance? Essentially, they sued once, won, and then when the assembly fine tuned the law to allow audits, they went right back to court. Daniel, I am going to be “crashing” the rally with AQE this morning. i plan on taking lots of pics and I will update you! Where parents and students forced to rally? Thanks so much for the information. The primary concern I have about such a practice is that kids, many of them very young elementary school kids, are essentially being told that a specific position on a contentious and widely debated issue is correct. I find this practice to be a huge abuse of power by Success; they’re using their influence as an educational institution to manipulate their students as political tools. 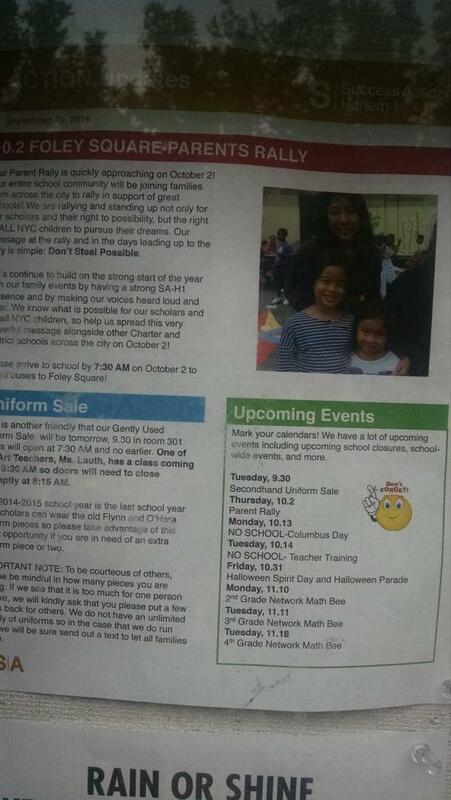 I would imagine that people would be outraged (as they should be) if the superintendent of a traditional public school district restructured a school week to bus kids to an anti-charter rally. The other point I would make is that there are much more important issues debated all the time. Should schools bus kids to rallies about the drug war, voter identification laws, paid sick days, global warming, etc.? Unlike the debate about charter schools, these debates very clearly have a “side” that’s best for low-income kids, but I find it hard to believe that Success would similarly restructure the school day and bus students for them. 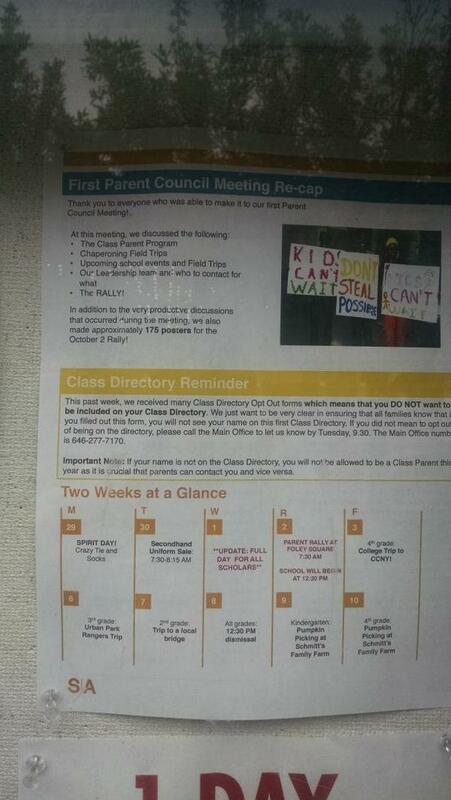 Actually, Thursday’s are 1/2 days for students. The teachers get professional during this time. School hours are 7:30am – 4:30pm all other week days, so there’s no time lost. On the day of the rally, class will be held during the 2nd half of the day. Assuming that is accurate, that is good information to have. One still has to wonder how, if the day is scheduled to be off at 9am, they intend to guarantee the promise of 10,000 people showing up. This is not an organization prone to making idle promises in public. Thanks for the update, Mindy…may I use your picture from Twitter to update this? Of course you can!!! You are free to use any pic or post of mine. No need for my permission. I will be posting many more today. At the rally, they said several times they had 21,000. How they came up with that number? Who knows? There definitely was a showing. My guess between 5,000-10,000. I saw some aerial photos. I have no expertise in crowd estimations, but they would have had to have jammed in very tight for 20K and above. I could be wrong for I don’t have expertise either in crowd estimations, but it just did not seem like 21, 000. Mindy – Shouldn’t you have been teaching on a school day instead of at the rally? Perhaps you took a personal day off. I often wonder how you have time to teach as you appear to spend a lot of time posting comments all over the web. It would be interesting to see how many of these are during your work hours. They are all time coded so should be easy to figure it out. I keep waiting for you to write something critical of the child molesters in the Catholic church – since they run the institution at which you teach. Apparently you have lots of time to criticize inner city public school educators but no time to criticize child molesters. I have told you in more than one forum that the purpose of my blog is to discuss public education. Your repeated efforts to goad me into some sort of response to your off topic inquiries and your efforts to implicitly and explicitly malign my character are neither welcomed nor appropriate. Due to your repeated insistence upon trolling my blog (and due to your aggressively insulting behavior towards me on Dr. Ravitch’s blog), you are no longer welcomed to comment on my site. This is a shame. I had hoped that you had gotten such adolescent impulses out of your system the last time, but it is obvious that this is entirely within your character. I had never imagined that someone who had the professional skills to be affiliated with an institution as prestigious as the Hubert Humphrey School would be so prone to junior high debate team tactics, but I was sadly mistaken. I regret having to block anyone from access to these discussions, but you have now repeatedly demonstrated that your purpose is to try to discredit me in the eyes of readers by your infantile accusations about my character solely because I will not entertain a conversation that is completely off topic for this blog about public education. Good for you Daniel and good riddance to Dr. Nathan!! !